LP® SolidStart® I-Joists are known for their value when it comes to size, strength, and reliability. Manufactured with a wide flange for increased stability and a larger nailing area, LP I-Joists offer exceptional performance and dependability. 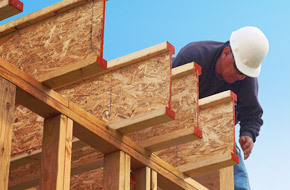 Our LP SolidStart I-Joist product line offers flanges made of either solid sawn lumber or LVL to meet the needs of residential, commercial or industrial applications.